Last year I heard Rachel Vail read the first chapter of her middle grade novel, Unfriended, at a NYC Teen Author Reading Night and she totally stole the show. In both her writing and the way she read, Rachel completely nailed the voice of an eighth grader. The ambitious novels switches perspectives between sixth eight-grade characters, and reveals their individual struggles, preoccupations, and anxieties. The author makes it look easy, but I have a suspicion juggling so many different characters within one story was anything but. The anchoring story centers on Truly being asked to sit at the popular table, which creates a chain reaction that messes up much of the eight grade social order. As the title suggests, the effects of social media and the Internet are made use of in the story. But one thing I REALLY liked about this book, is that it doesn’t pretend like cliques and bullying and exclusivity all developed because of Internet culture. It instead shows how teens harness the power of the new technology to do the same things to each other they’ve always done, just in a much more public/wide reaching scale. The genuine, but distinct, voices of each character stood out to me as the book’s key strength. I didn’t even really need the name at the top of the chapter to know who was speaking. I also liked that while there are some romancey elements, friendship remains the focus of the book. Reading it really felt like I was back in the eighth grade, sometimes in a good way and sometimes in a way that made me think of the Greek’s definition of catharsis. I don’t think I’m alone in not particularly wanting to go back to that age or time (even though I do kind of miss the glitter eyeshadow and my collection of B*Witched CDs). Unfriended bridges the gap between Middle Grade and YA in a lot of ways, which makes it kind of perfect for kids in middle school wanting to read up a bit. I don’t necessarily see it being a crossover novel that adults get into, but on the other hand I really enjoyed it so who knows? *I received a review copy of this novel from the publisher in exchange for an honest review. As always. all thoughts and feelings expressed here are my own. 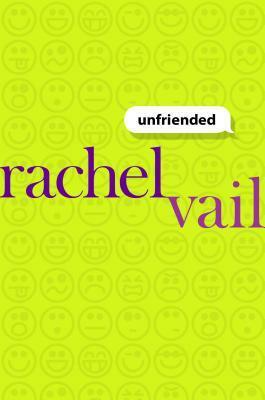 This entry was posted in Book Reviews and tagged books, rachel vail, unfriended by Alison Doherty. Bookmark the permalink. I’ve been a fan of Rachel Vail for years. Her books have always touched me. So glad you enjoyed this book! This was my first book by her, but it definitely won’t be my last. What a talented writer (and reader!). Read Wonder by her next! It was one of my favorites in junior high/high school! Cool. Will check that one out. I don’t know how I didn’t know about her books before this!